Taking care of yourself during the postpartum period or, "Fourth Trimester" (the six weeks after birth) is essential for healing, hormonal balance, breastfeeding and mother-baby bonding. Nurture yourself with nutritious placenta edibles. 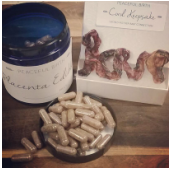 Placenta encapsulation involves gently heating the placenta, dehydrating it and putting it into capsules. You get to choose between gelatin, vegan or strawberry flavored capsules. Preparing it this way enhances the placentas healing and tonifying properties. Includes pick up/delivery, capsules and cord keepsake. This tincture is a potent, concentrated extract created by soaking a small portion of placenta in 100 proof alcohol and then setting it to ferment for 6 weeks. 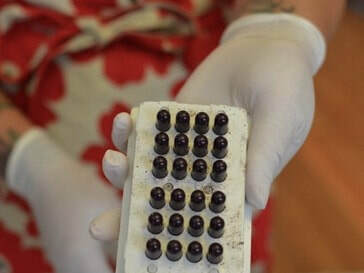 If stored properly (in a cool, dark place) the tincture will retain the nutrients and healing properties indefinitely. This is a great add-on to any encapsulation service; it will last long after your capsules are gone. Having a delicious, vitamin rich, organic fruit smoothie with a small bit of raw placenta in the mix gives mom a great energy boost and satisfies post-birth thirst and hunger. This tastes no different than a regular smoothie. A cold, fresh, organic fruit smoothie right after birth will be super refreshing! Yields two large smoothies. The umbilical cord is the sacred mother-baby connection. It is how the mother and baby share the same blood, oxygen, nutrients, hormones and emotions. Cord shapes (heart, star or circle) are all unique and vary depending on cord length. ﻿Commemorate your child’s birth with a keepsake art print! When the placenta is placed on paper and then removed, the resulting image is a beautiful "Tree of Life”. Currently serving Jacksonville, Florida, St. Augustine and surrounding areas.